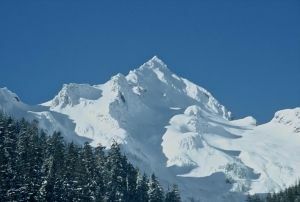 A sharply pointed rock peak located just east of Welch Peak in the Cheam Range. Although the low Conway Peak is the easternmost peak in the range, Foley is the easternmost peak of significance. Name Notes: Mt. Foley and its neighbours get their names from the turn-of-the-century engineering firm Foley, Welch & Stewart who, among other things, were the contractors in the construction of the Pacific Great Eastern Railway.